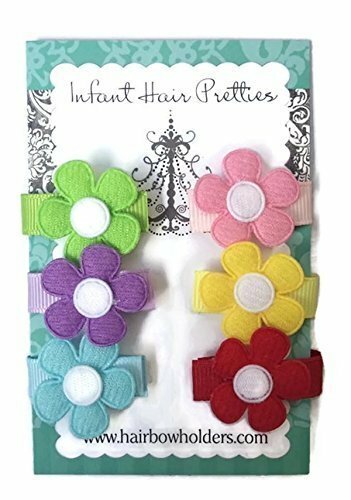 THIS LISTING IS FOR a 6-pack of INFANT HAIR PRETTIES!!! This Packet includes: 6 mini flowers (pink, green, yellow, blue, red and lavender). Each bow measures approximately 1 inch. They are soooo cute and soft. Enjoy these Infant Hair Pretties. As seen in Nordstrom's!! Simply squeeze into newborn's fine hair...all of these are Made with VELCRO® brand fasteners, velvet or grosgrain and an embellishment or two! No heavy clips. Perfect for the infant! HOW DO THEY WORK? I have sold thousands of these since 2004. There are many different ways to sport these little clips Made with VELCRO® brand fasteners.....Some moms squeeze them directly into her hair. Some moms wrap little tiny rubber bands around a section first and then squeeze the bow around the band....it grasps onto the hair AND the band (see photos). More colors and styles on main website: www.hairbowholders.com Securely packaged for yourself or as a gift. View More In Clips & Barrettes. If you have any questions about this product by Hair Bow Holders, contact us by completing and submitting the form below. If you are looking for a specif part number, please include it with your message.